A passerby got this shot of a fire in a Burlington Northern Santa Fe railroad maintenance shed near the Harris Overpass Thursday night. This is in the area where the city is doing work in preparation for construction of a new arena. Chief Fire Inspector Bill Moody said the building was being demolished, was “half down” before the fire and only contained “old paint.” The cause has not been determined. 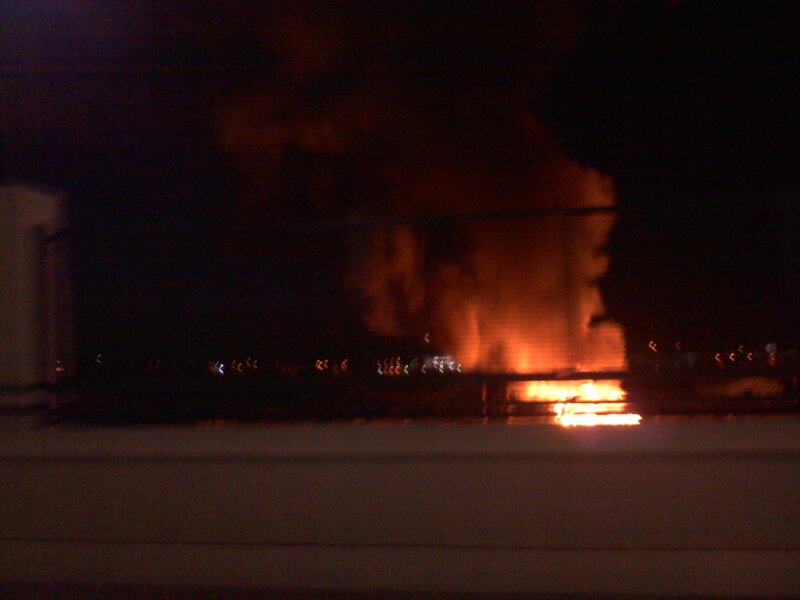 The view from the Harris Overpass as a fire burns Thursday night in a BNSF maintenance shed, which is in the area where the city is preparing to build an arena. Where is the LJS in this? Deena, you are unpaid reporter for Lincoln. Thanks. When I went over the Harris Overpass Friday morning this maintanace shed was packed to the top with “stuff” the open door or flaps/cover making the stuff visible to you as you drove over the overpass. Does anyone know what was in it? It was far from empty when I saw it.